Insomniac Games' Ted Price thinks his studio has the highest level of skill at working with the PlayStation 3. Insomniac Games might have ended its longtime development exclusivity with Sony consoles recently, but definitely not because the PlayStation 3 is too hard to work with. Insomniac Games CEO Ted Price recently said in an interview that he believes he's got the best PlayStation 3 team in the business. The PlayStation 3 was once notorious for being a tough system to develop for, with companies like Valve annoyed with its complexity. Price thinks his team has risen to the PlayStation 3 challenge better than any other. "First and foremost, I think we have a world-class engine team," he told Electronic Gaming Monthly. "In particular, they focus heavily on using the PS3′s SPUs more effectively (in my opinion) than anyone else in the business." 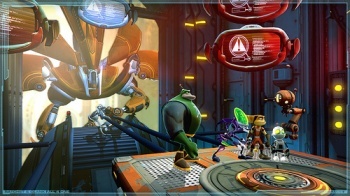 Insomniac was right there during the PlayStation 3's launch with the release of Resistance and has continued to support the system with multiple Ratchet & Clank titles, while Resistance 3 believed to be coming out in 2011. This is an interesting statement made by Price because it seems to be made solely from a technological standpoint, but the use of technology typically leads right back into what a studio can do with design. Price says Insomniac kept revising its PS3 "tech" after the release of Resistance which has allowed it to reach the level of skill it has today. Insomniac is definitely one of the PlayStation 3's top developers, but I think Naughty Dog, the studio behind Uncharted 2, and Guerilla Games, the studio behind Killzone 2 and Killzone 3, might have a few bones to pick with who's "the best." But of course, who's really going to say that his own studio, which could be compared to one's child, isn't the best at everything.